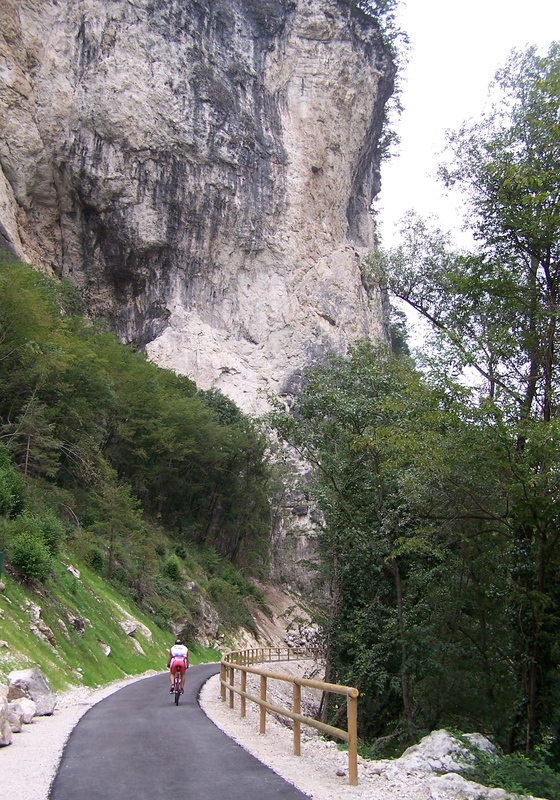 This morning I lead six cyclists on an easy ride up our beloved Brenta bike path. 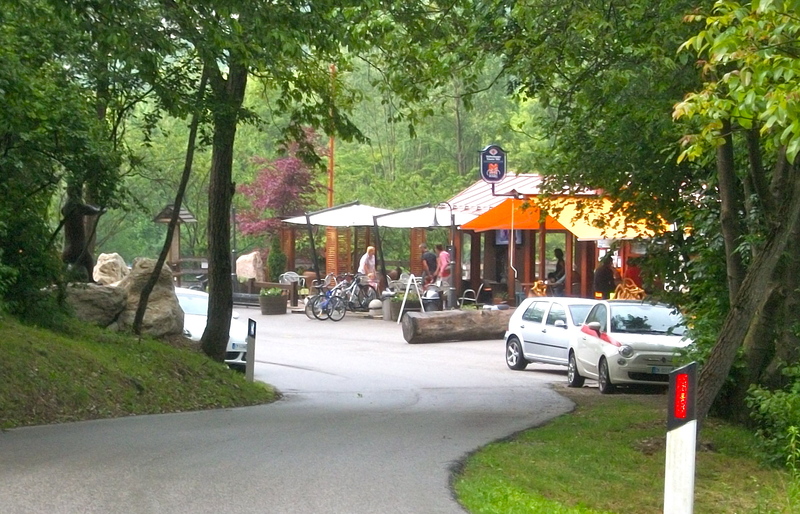 We stopped for coffee at the delightful BiciGrill, which everyone loved. When it was time to resume the ride, four of the riders informed me that they’d decided to turn back. It was no problem, since they knew the way, but I was disappointed: how could anyone resist the lure of such an enchanting bike path? A woman I’ll call Ann, and a guy I’ll call Bob, wanted to continue; they were primed for a little adventure. It was Bob’s fourth trip to the area but he’d never been so far up the bike path. Nor had he ever seen and enjoyed so many things, because he usually rides in a fast group which provides no opportunity to enjoy the scenery, take photos, or savor the atmosphere. He was really relishing this “new” way of riding, which was proving to be a revelation. 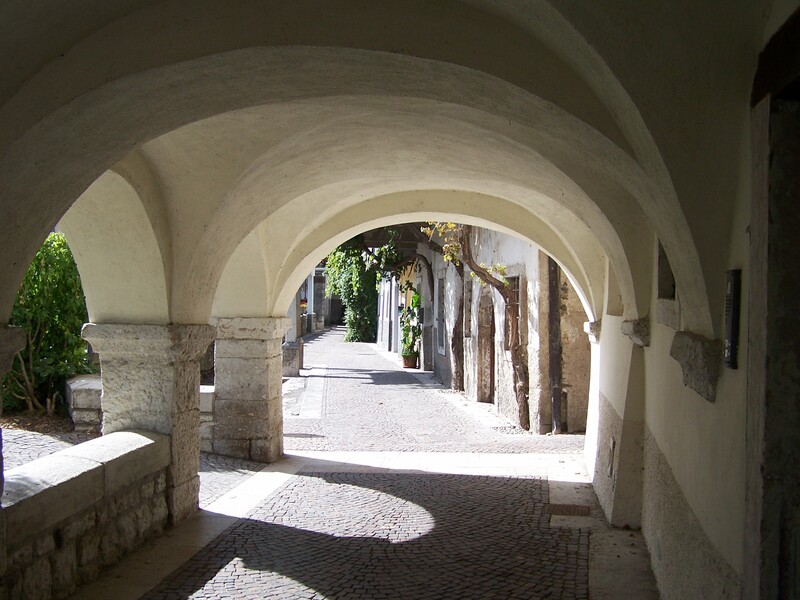 We arrived in Borgo Valsugana and rode beneath the arcade that runs along the river, and he was amazed and delighted. We would have liked to cruise around town, sit down to eat, and take a later train back, but no! Ann said she didn’t want to be back so late and wanted to get on the next train. I was annoyed, not understanding why people need to impose agendas on themselves while on vacation, and irritated because our enjoyment of the town was compromised on her account. (You can see more photos of the bike path on my photo gallery). The train is usually uncrowded but on this day and at this hour it was packed, mostly with students, and there was no dedicated bicycle car (I later learned that it was only in service in July and August…evidence of a total lack of logic on the part of Trenitalia). There were three other bikes there already. We had to sit on jump seats and hold on tight to our bikes, so we couldn’t even eat the sandwiches. However, the conductor never asked to see our tickets, so we had no chance to pay the extra bike transport fee and thus saved a few euro each. A few stops later, a trim, bearded man in his 60’s, neatly-groomed and casually but neatly dressed, got on the train with his city bike. The conductor immediately showed up and told him there was no more room and that he had to get off. The man refused. He said politely that he’d paid for the trip, including his bike, and that was that. The conductor replied that just because he had a ticket didn’t mean he had the right to ride on that particular train, and that he could ask for a refund if he didn’t like it. He stated that there were two spaces per carriage allotted for bicycles, and no more than that were allowed (he didn’t tell us to get off however). “Where does it say that? I’ve never seen such a rule stated anywhere,” replied the gentleman. “I can’t do that,” replied the man. “I have an appointment in Vicenza, and need to get to Cittadella in time to make the connection. Look, I’m trying to do my trip in an ecological way, as citizens are encouraged to do.” Then he added, with a knowing little smile, that he had worked 23 years for the railroad himself, and yeah, yeah, he knew quite well the way things worked. (All the while, I was providing a running translation to Ann and Bob, while trying not to laugh out loud). He was relaxed, composed, and unperturbed, never raising his voice, and acting rather amused by the whole situation, which he obviously didn’t take seriously. The conductor was now quite angry, and told the man that if he kept it up, he would call the Carabinieri! This amused the man even more, and indeed, what would the Carabinieri have done with this mild-mannered, courteous man who just wanted to get from point A to point B, and was causing no ruckus? The conductor would have looked like a fool. He stomped off, and undoubtedly aware that he could not back up his threat, and was in effect powerless, never returned. I grinned at the man and gave him a sign as if to say, “good for you, standing up to him like that.” The man smiled back. 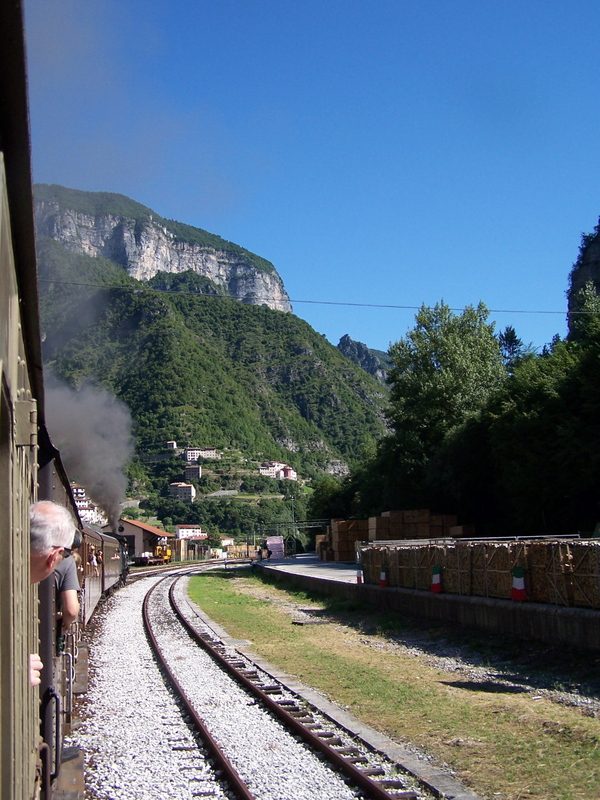 Epilogue: Bob and I did take the train back to Borgo a few days later and resumed our journey up the bike path. We stopped often to take photos, enjoyed a leisurely lunch in Caldonazzo, rode along the lake, and took the train back from Pergine.